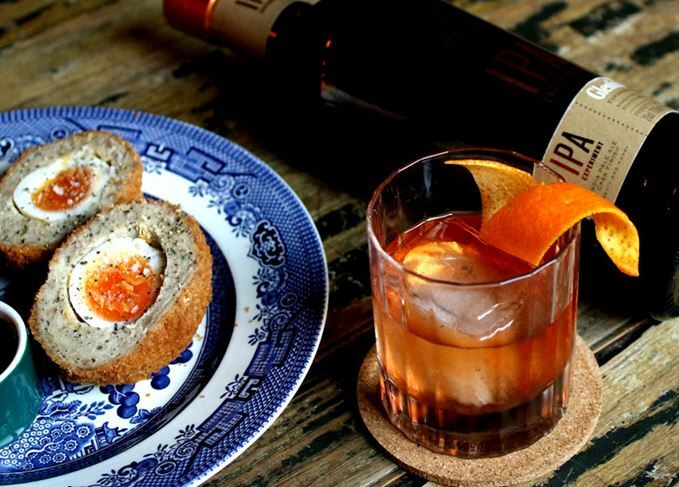 London is set to come to life this week with Burns Night suppers, whisky flights and £6 cocktail tours, as the first Scotch Whisky Weekend gets underway. Here are Becky Paskin’s recommendations of the festival’s unmissable dinners, drinks and drams. The inaugural Scotch Whisky Weekend (SWW) is landing in London on 23-27 January, bringing Burns Night suppers, cocktail tours and more whisky-fuelled fun than a ceilidh at a Scottish wedding. All over London, bars will be putting on exclusive £6 Scotch whisky cocktails in celebration of Scotland’s national spirit, and as a timely homage to its national poet, Robert Burns, whose birthday falls on 25 January. There’s no shortage of traditional Burns suppers to be had, but the weekend also represents an opportunity to explore Scotch whisky’s diversity and versatility through countless whisky flights, cocktails and food pairings. Brought to you by London Cocktail Festival organiser Drinkup.London, in partnership with Scotchwhisky.com, the weekend is set to be the capital’s biggest celebration of Scotch whisky. Not sure where to start? Whether you’re after a Burns Night feast, to sample some limited edition drams, or enjoy a self-guided £6 cocktail tour, we’ve got you covered with some of our favourite festival highlights. For a full list of participating bars and exclusive events, and to register for your free digital festival pass, head to drinkup.london/our-festivals/scotch-whisky-weekend. A traditional Burns supper calls for haggis, neeps, tatties, plenty of toasts, a piper and, of course, whisky. From staunch traditionalist affairs featuring all of the above, to modern interpretations (think foraged ingredients and battered Mars bars), there’s a supper to suit every palate. If the former is more your style, and you’ve never experienced Burns Night with all the trimmings, head to Smith & Wollensky in Covent Garden for a three-course meal (£59pp) complete with a dram of Macallan 12 Year Old, a piper and a traditional Address to a Haggis. Alternatively, Bread Street Kitchen in the City has also partnered with Macallan to host a four-course feast (£70pp). Tuck into haggis croquettes and smoked salmon blinis while sipping on a Macallan cocktail, before indulging in traditional Cullen Skink and a Highland venison and haggis wellington served with whisky sauce. Cocktails and drams have been selected by Macallan UK ambassador Terri Brotherston to match each dish. For something a little more 21st century, Cub in Hoxton is putting on a ‘killer Burns Night supper celebrating modern Scotland’. Expect awesome cocktails and a relaxed vibe with foraged ingredients incorporated into a delicious menu from chef Craig Grozier. Don’t worry, the haggis and its piper will still be the stars of the show. Burns suppers are also being hosted at Corrigan’s Mayfair, the Devonshire Club, Hix Soho and Oyster & Chop House, and Galvin at The Athenaeum. Burns Night traditions aren’t for everyone, but then again, the Scotch Whisky Weekend isn’t all about Burns Night, and throughout the festival there are plenty of whisky experiences to dive into, with flights starting at just £6. The Scotch Malt Whisky Society’s (SMWS) two exclusive London venues on Greville Street and Northcote Road will be opening their doors to the public and offering the chance to sample the members’ club’s special Burns bottlings. For £15 guests are given access to the exclusive members’ room, a sample of two drams, plus a selection from the bar snack menu. The SMWS outlet in Northcote Road is also putting on a special menu of three whisky cocktails, created using their exclusive Burns bottlings, for just £6 each. The Soho Whisky Club on Old Compton Street is also welcoming the public for just one day only on 26 January. The private members’ club is an oasis for whisky lovers in the heart of Soho, offering thousands of whiskies ranging in price from £4 to £1,000. Plenty of bars are also offering whisky flights, including Hawksmoor Spitalfields which offers a special £6 flight featuring a Caol Ila six-year-old, Linkwood 11-year-old and Invergordon grain, but if you’re in the mood for a little shopping too, pop into one of The Whisky Exchange outlets in Covent Garden and Fitzrovia. While browsing for a bottle to take home, visitors can also indulge in a special £6 SWW whisky tasting of three drams, chosen to represent three very different styles of Scotch whisky. If you’ve left plans to the last minute, or fancy seeing out the weekend with a dram and some live music, get over to Swift in Soho where £6 Ardbeg pours of An Oa, Uigeadail and Corryvreckan are the order of the day. Opt for a single, double or cocktail made with your favourite, or trade up with a very special pour of Ardbeg’s 2016 Dark Cove Committee Release for £10 a dram. There’ll also be free Scottish canapés. Sounds like a winner to us. Any good bartender knows the Scotch cocktail is a thing of beauty, and bars across London are celebrating its diverse flavour spectrum and mixability by putting on special SWW cocktails for just £6 each. Follow your own cocktail trail through London’s participating venues with a bespoke itinerary, or select a handful to visit throughout the weekend. Not sure where to begin? You can’t go wrong with a classic, and the Bobby Burns (Scotch, sweet vermouth, Bénédictine), a 1930s invention offered at 68 & Boston in Soho, is as classic as they get. You could choose to stay in the area with a Pass-Port (Elements of Islay Peat, Monkey Shoulder, rhubarb cordial and Aperitivo del Professore) from Henson’s Bar at Mimi’s Hotel, or a Hive Mind (Glenfarclas, banana caramel, bee pollen tonic) from Hercules. Over in Shoreditch warm up with a Hot Burns (Scotch, spiced butter and hot water) from TT Liquor before indulging with Black Rock’s Scotch Gimlet (Craigellachie 13, pineapple and black pepper cordial, whisky mixer), and rounding things out with a Beyond the Pond (Scotch, dark rum, Sherry) from Discount Suit Company. Wherever you end up, chances are you’ll discover a new favourite Scotch cocktail, and at a bargain price too. Ultimately, SWW is an amazing opportunity to explore Scotch whisky and discover its fun side, whether that’s through sampling neat drams, tasting delicious cocktails, indulging in traditional Scottish fare or enjoying some live music. Earn your drams with a spot of ice skating – that most traditional of Scottish pastimes – at the Skylight Rooftop in Wapping, before dancing the night away to a live DJ or snuggling under a blanket with a warm whisky cocktail. A special Burns Night party on 25 January includes live pipers, a free Glenfiddich cocktail on arrival plus whisky tasting sessions and special Glenfiddich drinks prices all through the night. Not to be outdone, Mr. Foggs in Mayfair is putting on a live ceilidh band, Burns poetry recitals and special Scotch cocktails, while Nine Lives in Southwark is taking a more tropical approach with a Caribbean-themed party complete with Glenfiddich 21 Year Old cocktails and jerk haggis. The place to start and end your Scotch Whisky Weekend has to be Callooh Callay, where Monkey Shoulder has set up residency. Kick things off with a cocktail workshop by brand ambassador John Wayte on 23 January, before celebrating all things disco with some ‘super freaky’ ‘90s drink and music classics. If you can’t get enough of those funky disco beats, head back to Callooh on 27 January for a closing party with attitude, as global Monkey Shoulder ambassador Joe Petch takes to the decks.